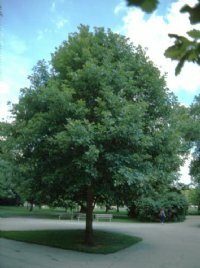 SWAMP WHITE OAK - a medium to large, long-lived white oak with a spreading crown, reaches 45 to 60 feet in height and spread. Adaptable across the central and northern U.S. Not recommended for use in areas colder than zones 4/5, not tolerant of alkaline soils which cause chlorosis on this specie. Native across the eastern and midwestern U.S. "